Hester Bateman (British, c. 1709-1794). Teapot, 1782. Sterling silver and ebonized wood, 3.75 x 10 x 3.13″. Kamm Collection 2000.118. Photo: David H. Ramsey. Hester Bateman (née Needham or Neden) was an English silversmith known for creating high-quality, lightweight home wares in the 18th century. Like many craftswomen in 18th century Europe, Bateman was trained in her craft as part of a family business, rather than through apprenticeship with a master craftsperson outside her family. Her husband, John Bateman, was a practicing goldsmith and jeweler, who may have worked under contract for freeman goldsmiths who were licensed to operate independently in London until 1747, when the family moved to a house on Bunhill Row, which was located just north of London city limits at the time. Because of its proximity to the city and exemption from municipal laws, Bunhill Row and the surrounding neighborhood was the home of many informally trained tradespeople and their businesses at this time. The Batemans built a workshop on their property in Bunhill Row and opened an independent smithing business. Four of Hester Bateman’s six children also trained as metalworkers through formal apprenticeship, as well as one of her sons-in-law, all of whom worked in the Bateman family’s business. One of Hester Bateman’s daughters-in-law, Ann Bateman (née Dowling), was also trained in silversmithing through her parents’ family and worked in the Bateman family’s smith. When John Bateman died of consumption in 1760, Hester took over as head of the business, and registered her mark at Goldsmiths Hall in 1761. Though there are no works stamped with Hester Bateman’s mark prior to her husband’s death, and very few of her marked works from 1760 to 1774, there is strong evidence to suggest that she had been trained before 1760; in his will, John Bateman left all his tools to his wife, which would have been highly unusual if she had not been able to use them. Hester also took over the training of her late husband’s apprentice, John Linney, who was later her employee. It is likely that she produced works under her husband’s mark prior to his death, and that, prior to 1774, many of her works were commissioned by other silversmiths who covered her mark with their own before selling them to the final customer. Bateman continued to run the family business until she retired in 1790. She was briefly succeeded in running the business by two of her sons, Peter and Jonathan, who co-owned the business and registered as shared mark. After Jonathan died of cancer in 1791, his widow, Ann Dowling Bateman, succeeded him as partner and registered a shared mark with Peter Bateman that same year. Hester Bateman primarily created small-scale, practical home wares, such as cutlery, plates, urns, and jugs. She also made many works for ecclesiastical purposes, such as chalices and offertory plates, as well as some commissioned medallions, chains of office, and other personal items. Bateman formed her works out of sheets of sterling silver, an alloy containing more than 92.5% silver, usually mixed with copper. Many of her works, such as this teapot, have handles and finials made of wood or bone, which transfers heat less readily than metal and prevents the user from being burned. Bateman’s works are considered part of the Georgian Style, which broadly encompasses decorative art styles popular in England and its colonies during the reigns of King George I (1714-1727), II (1727-1760), and III (1760-1820). This teapot incorporates many popular elements of Georgian Style, including a simple, geometric forms, decorative representations of fruit and leaves on the body, and, curling, leaf-like ornamentation on the handle. Bateman used this oval cylinder form and flush, hinged-lid in many teapots, as well as hand-raised floral, fruit, animals, or geometric designs on the surface of the teapot of her works. In other works, she also often incorporated one or two lines of beading design along the edges or bottom of the work, though this teapot does not use this technique. During her lifetime, Bateman’s work was most popular among middle-class families in England. Due to industrialization, many English families had newly acquired wealth, and silver housewares were a popular form of affordable luxury for those families. Bateman’s works, though stylishly decorated and made with high-quality materials, were less elaborately ornamented than those of many of her contemporaries, and were less expensive to produce and more affordable to purchase. 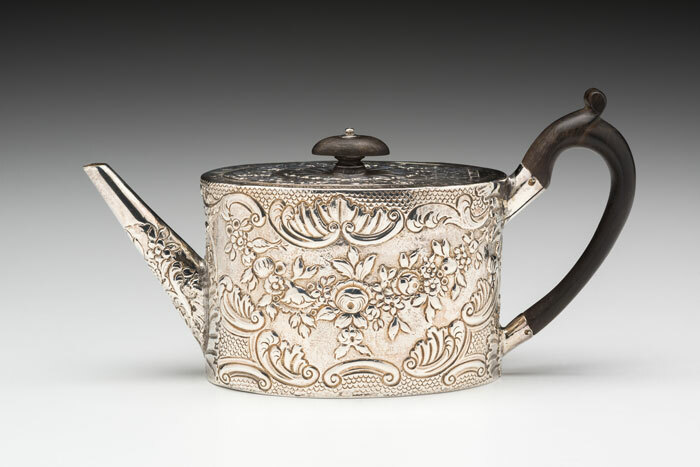 With the growing popularity of tea drinking among all classes in England, silver teapots and tea sets were common purchase for middle-class families that could afford them, and Bateman produced many teapots and tea services in this style. Currently, Bateman’s work remains popular with antique silver collectors. This is in part due to the enduring appeal of her decorative style, and in part to the availability and financial value of her work. Due to her prolific production, Bateman’s works are relatively easy to acquire, and are not concentrated in a small number of museums or private collections. Her works were also made from solid, high silver-content alloys, rather than from Sheffield Plate, a form of silver-plated copper sheeting invented in 1745, which many of her contemporaries used instead of silver sheet. More examples of Bateman’s work can be seen in the National Museum of Women in the Arts, the Birmingham Museum of Art, the Museum of Fine Arts, Boston, and many others. For a detailed biography and historical context, check out Hester Bateman, Queen of English Silversmiths by David S. Shure (1959), now available for free online from Hathi Trust. “Silver.” Encyclopædia Britannica. 09 Jan 2018. Eatwell, Ann. “Bateman, Hester.” Dictionary of Woman Artists, edited by Delia Gaze, Fitzroy Dearborn, 1997. Griffin, Rob. “Precious Metal, but Look Beyond the Hallmark.” Sunday Business [London, UK], 19 Aug 2001. Hartley, Cathy. “Bateman, Hester.” A Historical Dictionary of British Women, Taylor and Francis, 2013. Shure, David S. Hester Bateman: Queen of English Silversmiths. Doubleday, 1959.